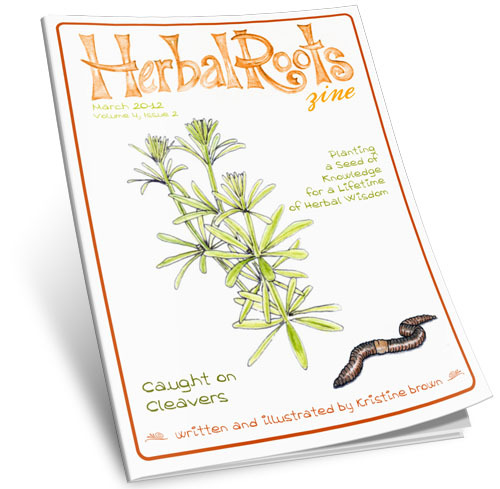 This month’s issue is all about Cleavers. Known by many other names such as Bedstraw, Clivers, Goosegrass, Stickywilly, Stickyjack, Stickyweed, Stickyleaf, Catchweed, Robin-run-the-hedge and Coachweed. Whatever you prefer to call this plant, Galium aparine is a great plant to find growing in your back yard. This herb is well known for his affinity with treating all sorts of lymph problems, nervous system problems and urinary problems. This month you’ll learn all about his healing power plus learn the most potent way to create herbal medicine with this herb. There are lots of easy recipes including smoothies, juice and ointment plus some fun crafts that make Cleavers very versatile. This issue has been revised to add more sections with an expanded All About section. 37 pages from Cover to Resource.